Yes, today we visited another National Trust property; our 3rd this week! Today we went to Polesdon Lacey in Bookham. With its stunning views of the Surrey Hills, large grassy areas, woodland walks and adventure playground, Polesdon Lacey is a great place to go for a day enjoying the outdoors. We have been a few times before and we have found something new to see and do every time we’ve been. Today we went with Caterpillar Tales mummy and youngest so we stuck to a walk we have done before, knowing it was child and buggy friendly! We actually walked the route of this years Easter Egg Trail. In our usual way we arrived at lunch time so the first thing we did was have our picnic. Once sandwiches, crisps, veggies and cakes had been eaten it was time to explore. 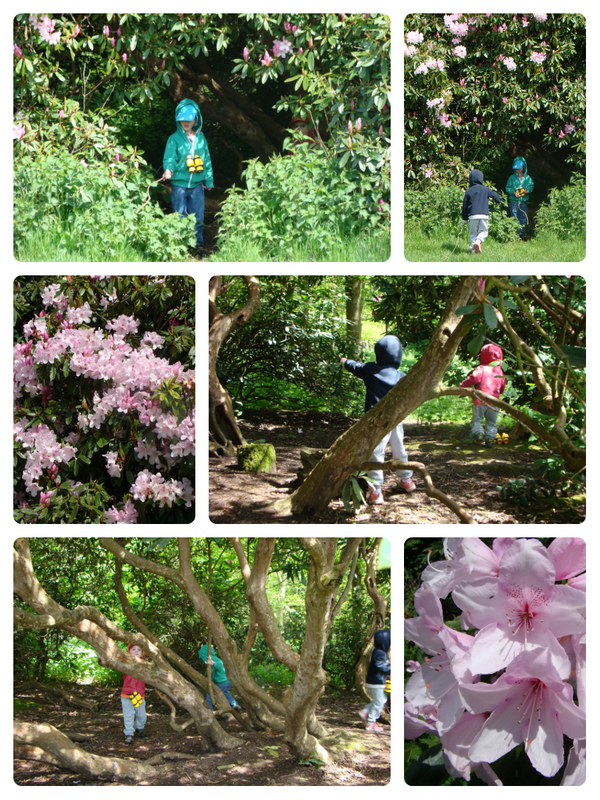 The kids couldn’t wait for us to tidy and pack away so they found a nearby rhododendron that made the perfect den for them to play in. Once we managed to coax them away from their den we headed down Admirals Walk. 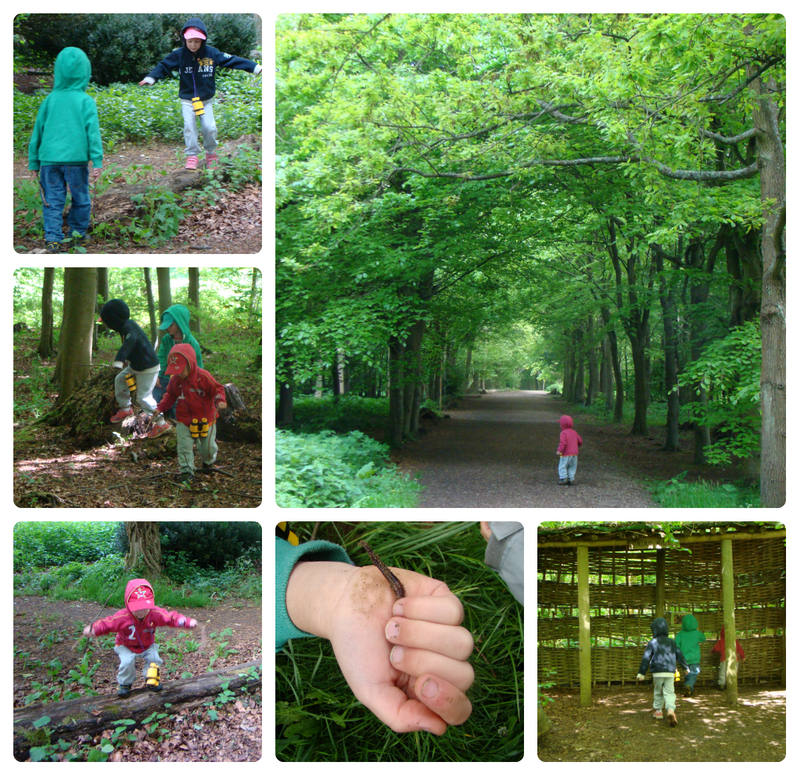 Along the way we balanced on logs, clambered over tree stumps, admired the bluebells and hunted for bugs. We also stopped off in the bird hide but for the first time ever we didn’t see any birds. I don’t think the kids were that bothered really, but I was disappointed because previously we’ve seen a lot of different birds there. 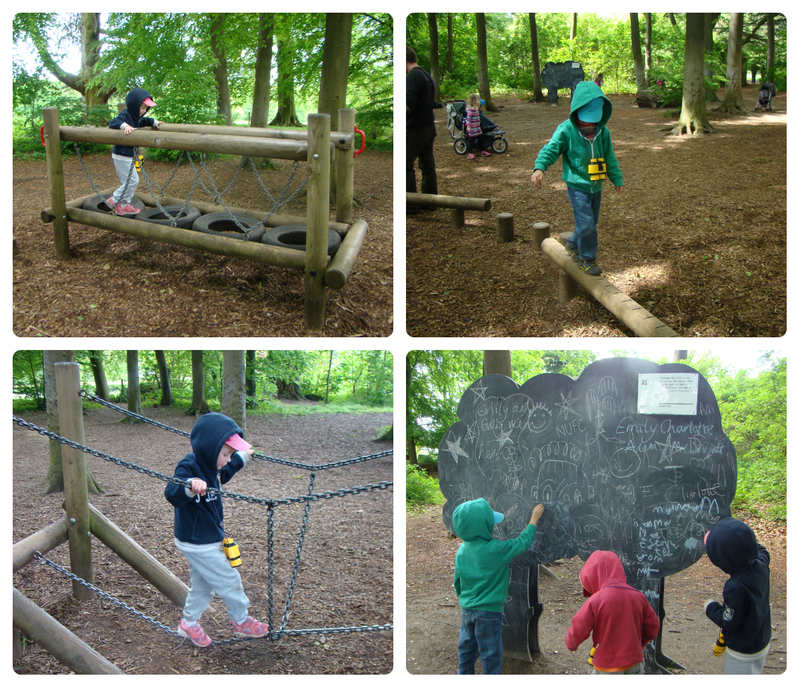 Our next stop was Squirrels Corner, an adventure playground made from natural materials. All the kids had a great time here and went round the course several times each! They also found the chalkboards and some natural chalk to do a spot of drawing. When we left the playground we walked back to the house over the lawn and through the woodland. I showed the kids how to pull grass seed off the wild grass growing high, something I used to love doing as a child! They spent a long time picking grass and spreading the seeds and blowing Dandelion Clocks on the lawn! Then there was more climbing and exploring in the woods. We ended our day at Polesdon Lacey with the ever popular rolling down a hill! This will never fail to entertain my kids and is quite amusing to watch as 2 of them haven’t really got the hang of it and end up going sideways most of the time! Today we completed 1, possibly 2 new challenges from the 50 Things on the National Trust list; we rolled down a really big hill (#2) and we went bird watching (#44) although we didn’t actually see any birds. 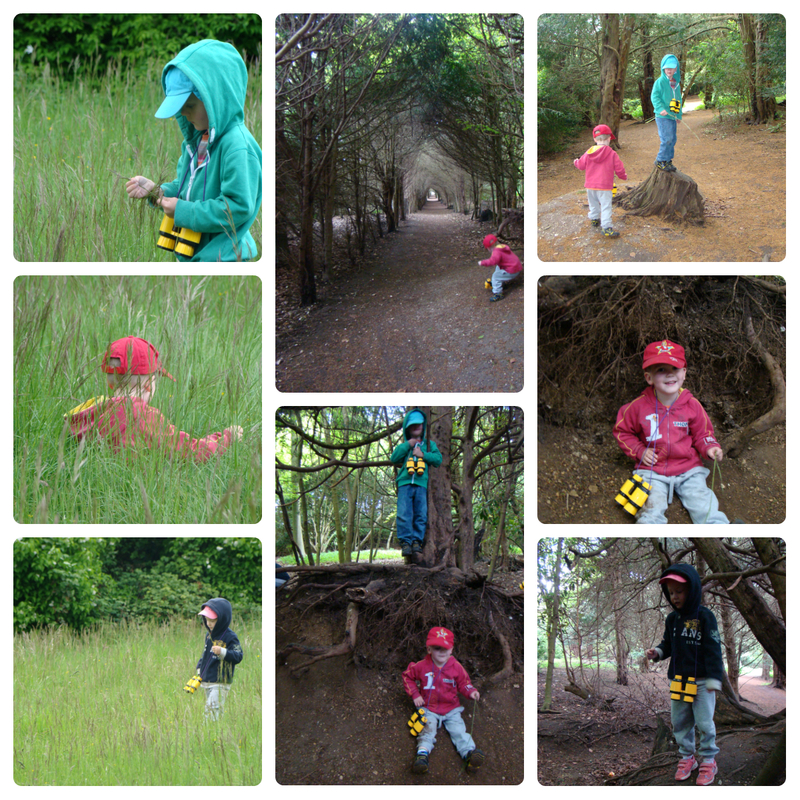 Next time we go I want to have a go at Geocaching. Polesdon Lacey is a popular place to do this it seems and they have recently added more caches. I really don’t know much about it at all (other than it is a high-tech treasure hunt) but it is on the 50 Things list and sounds fun! Anyone want to give me any hints and tips please? Judging by the pictures you all had a fab day out together and managed a few ticks off the list as well. Lots of play equipment and beautiful grounds to explore, as well as a spot of hill rolling – Thanks for sharing your day with Country Kids. Geocaching is great there – you can leave your membership card and get a free GPS to do it – it took us 2.5 hours – and we all need to make a plan so we can all do it soon! !